Wu Bing, a native of Jiangsu province, was a Southern Song court artist during the Shaoxi era (紹熙, 1190-1194) and served as a Painter-in-Attendance (待詔). This leaf from the album “Collected Gems of Famous Paintings (名繪集珍)” shows two rice plants with graceful leaves bearing heavy shoots of grain and drooping under their weight. Without any further background scenery and interspersed among them are two dainty and beautiful butterflies as well as a gadfly. 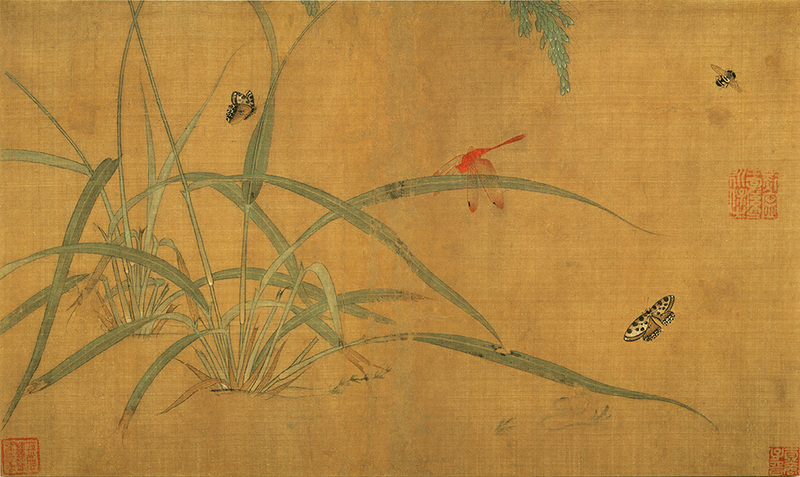 A dragonfly is also shown resting on one of the blades of rice. The plants and insects were all rendered with exceptional detail and naturalism. Since the top and left margins of the work appear to end abruptly, this painting may have once been part of a larger one that was trimmed (perhaps due to damage) to create the present form.